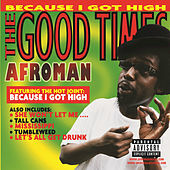 One of the biggest one-hit wonders of the new millennium, Mississippi-based emcee/producer Afroman scored a huge hit with his novelty single "Because I Got High." On his major label debut, his laid-back, comical flow takes center stage, with witty, self-deprecating rhymes set to retro-style 808 beats and Too Short-esque basslines. 2001 Republic Records, a division of UMG Recordings, Inc.